Are you noticing a Monday trend around here? Most recipes I post on Mondays tend to be breakfast themed. The weekends are the best to make a big breakfast. Plus day time light is great for food photos too! Recently I received a GIANT box of Hatch chiles in the mail from The Hatch Chile Store. Talk about a great mail day! I washed them up and let them sit on the counter while I thought of fun ways to use them. When I woke up the next day I knew I needed to spice up breakfast. Due to some severe stomach pain <insert frowny face here> I have been eating a gluten free diet for the last six weeks so English muffins, traditionally used in Eggs Benedict, were out of the equation for me. Hashbrowns made the perfect gluten free alternative though. 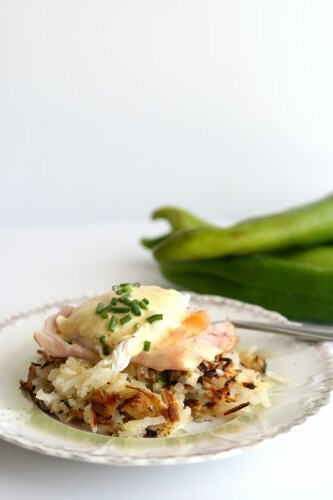 When making the hashbrowns I added some chopped onions and Hatch chiles. It gives them a little za-za-zing! Who doesn’t love some za-za-zing on a Saturday morning?! If you don’t have any of the coveted Hatch chiles substitute an Anaheim or poblano pepper. Can’t handle the za-za-zing then leave the pepper out entirely. 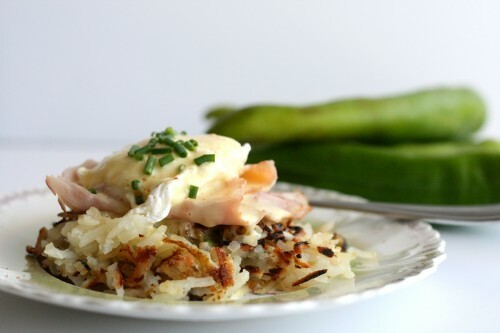 If you’re frying up hashbrowns and poaching the eggs please, oh, please DO NOT skip making your own hollandaise sauce. It takes just seconds to do in your blender or food processor. 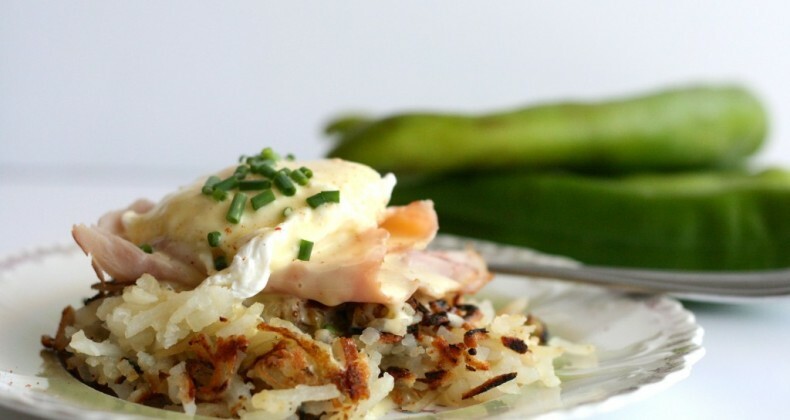 Fresh hashbrowns are the best and I really like the Simply Potatoes brand you find in the refrigerated section usually by the eggs and bagels. 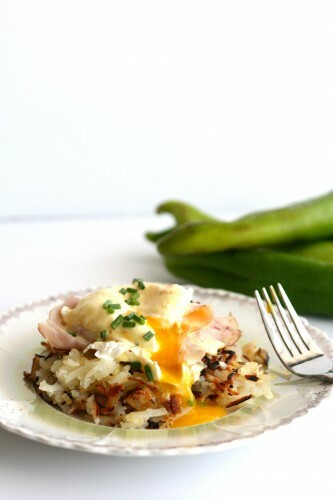 Layer all the ingredients together for a restaurant worthy breakfast. If you want some chiles of your own you can order fresh or frozen chiles from their website. In a large skillet over medium heat. Drizzle 1 tablespoons oil. Saute onion and chile for 5 minutes or until softened. Add 2 tablespoons oil and hashbrowns. Press in a even layer. Cook 6-7 minutes. Drizzle additional 1 tablespoon oil over potatoes and flip over. Cook another 6-7 minutes. 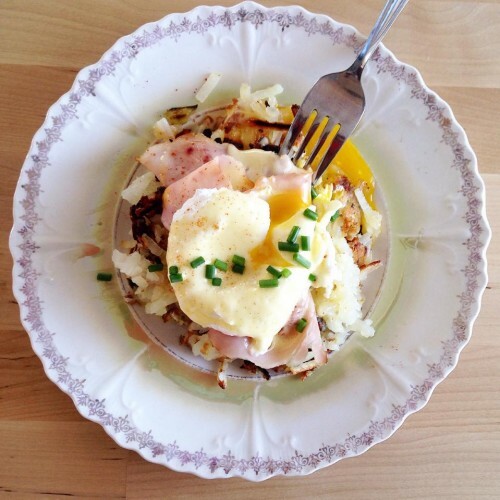 To assemble: hashbrowns, cooked ham, poached egg, and a drizzle of hollandaise sauce. Garnish with sprinkle of paprika and snipped chives. In blender add egg yolks and lemon juice. Blend on medium high speed for 30 seconds, or until yolks become light in color. While blender is running, drizzle in melted butter. Omg this looks fabulous! I may have to make a veggie version without the ham! How incredible does this look? Wow! 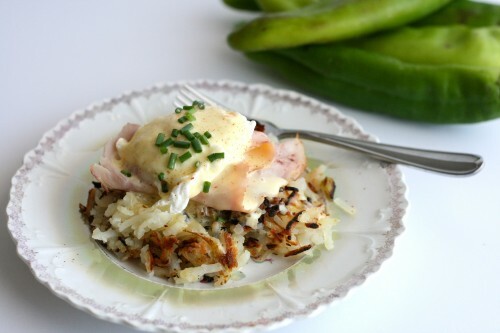 Love this flavorful twist on eggs Benedict! Spicy peppers and smooth Hollandaise sauce were meant to be together! Loving this savory breakfast. Might have to save this recipe for the holidays, looks so pretty that it has to be a special occasion! The weekends are always the best times for long breakfasts. Hatch chiles are the best too. I love love this!!! This looks so delicious! Pinning to my gluten free board. One quick note due to having a family member who eats gluten free, not all hash browns are gf, so you do want to read the label. Good note! I try to double check all labels.